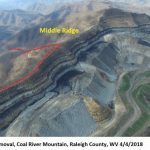 Since 2007, peer-reviewed studies by researchers from more than a dozen universities have concluded that mountaintop removal coal mining contributes to significantly higher rates of birth defects, cancer, cardiovascular and respiratory diseases among individuals living in the region where it occurs. In 2014, researchers demonstrated that toxic dust from mountaintop removal promotes the growth of lung cancer cells in people living nearby. It is the first time a direct link has been established, rather than a correlation, thereby supporting the previous science that mountaintop removal is harmful to human health. Chart of average age-adjusted number of annual deaths per 100,000 due to cancer from 1997 to 2007 showing that nearly all counties with mountaintop removal mining are above the national average. Compared to the national average, the communities of Appalachia where mountaintop removal coal mining is most prevalent have seen staggering rates of cancer diagnoses in recent years. In 2011, a peer-reviewed study found that self-reported cancer rates in counties where mountaintop removal occurs are nearly double the rates in nearby counties with no mountaintop removal. The study concludes that among the 1.2 million Americans living in counties where mountaintop removal occurs, as many as 60,000 additional cases of cancer are linked to the practice . 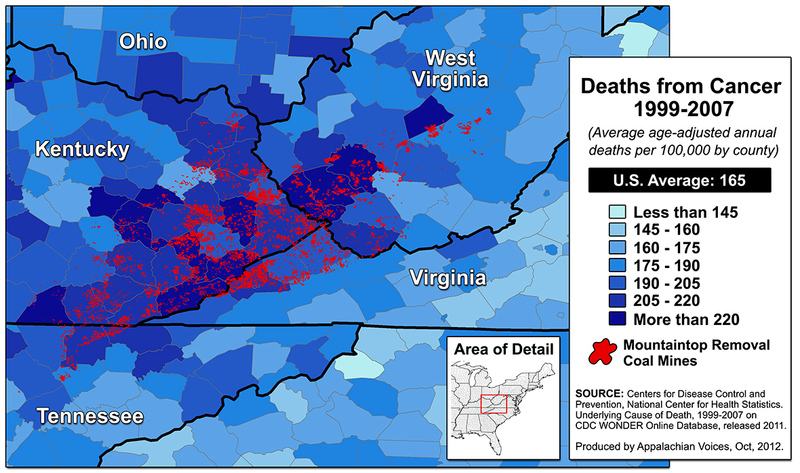 In 2010, researchers used a geographical information system (GIS) analysis to determine how cancer mortalities in West Virginia relate to proximity to coal-mining activities including mines, coal slurry disposal sites, and processing plants. The data revealed that proximity to mountaintop removal, more than any other coal-mining activity, significantly increases health risks . West Virginia and Kentucky lead the nation in deaths per capita from cancer. Greater exposure to pollution from coal-mining activity increases the risk for cancer and other fatal diseases. 60,000 cases of cancer in Appalachia have been directly linked to mountaintop removal. Incidences of lung cancer and other respiratory diseases in coal-mining counties of Appalachia are disproportionately higher than the regional and national averages, after accounting for smoking and non-coal industry emissions. In addition, studies also show that communities near mountaintop removal mines have higher rates of lung cancer and other respiratory diseases than other Appalachian communities. 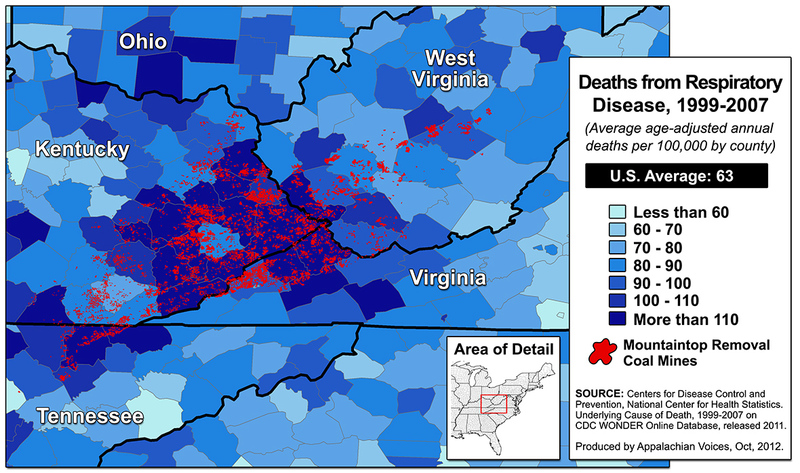 An analysis published in the international journal Lung Cancer found that the most heavily mined areas of Appalachia were associated with higher incidences of respiratory disease diagnoses and lung cancer mortalities . 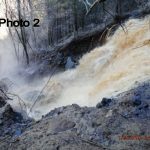 This link was not isolated to miners working directly with toxic substances; evidence of respiratory disease could be found throughout the overall population of Appalachian communities in close proximity to mountaintop removal sites. In 2014, using dust samples collected in communities near mountaintop removal mines, West Virginia University researchers found a direct link between air pollution and tumor growth. West Virginia and Kentucky lead the nation in lung cancer mortalities. Living in heavily mined areas increases the risk of lung cancer and respiratory disease. Levels of exposure to pollution are highest in areas with the most mountaintop removal. Scientists found a direct link between dust from mountaintop removal and lung cancer. Chart of average age-adjusted number of annual deaths per 100,000 due to chronic cardiovascular disease from 1997 to 2007 showing that nearly all counties with mountaintop removal mining are above the national average (click image for full size). A 2011 study investigating chronic cardiovascular disease mortality in areas with mountaintop removal found that, even after adjusting for poverty and other socioeconomic risks, mortality rates remained signiﬁcantly elevated in areas with mountaintop removal compared to other areas in Appalachia . The study found that incidences of heart disease increase with the amount of coal production. Researchers estimate that coal-mining activities contribute to an additional 1,072 annual deaths from cardiovascular diseases, with as many as 703 occurring in areas with mountaintop removal. A primary link between these types of deaths and coal activities appears to be the air pollution associated with mountaintop removal mining. Air pollution is well-documented risk factor for cardiovascular disease and heart attacks. Over time, breathing particulate matter, or dust, caused largely by the blasting apart of mountaintops, can lead to the formation of plaque and inflammation, and can increase the risk of high blood pressure, atherosclerosis, and heart attacks. These risks are more severe in populations with high rates of diabetes, obesity and tobacco use . 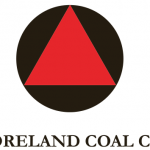 Heart disease is the leading cause of death in Appalachian coal-mining communities. 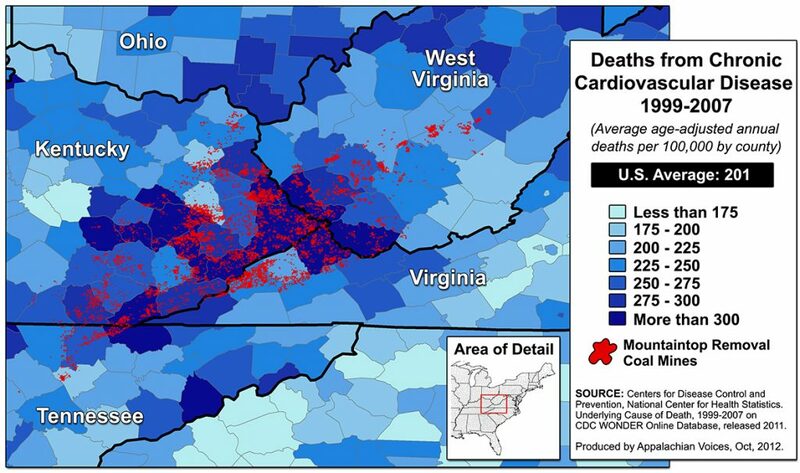 Areas with mountaintop removal have signiﬁcantly higher mortality rates from cardiovascular disease than other parts of Appalachia with similar levels of poor health, smoking and poverty. More than 700 additional deaths from heart disease occur annually in areas with mountaintop removal compared to areas without mining. Partially due to the health risks associated with mountaintop removal, life expectancy and the number of preventable deaths in parts of Appalachia are some of the worst in the nation. Of the 3,147 counties in the U.S., the two largest coal-producing counties in Kentucky — Perry County and Pike County — were among the bottom ten for life expectancy between 1997 and 2007, according to a 2011 study published in Population Health Metrics. Counties in coal-producing southern West Virginia, including McDowell, Logan and Mingo, also ranked among the lowest 1 percent in the nation for life expectancy, while surrounding counties are all in the bottom 10 percent . While nationwide life expectancy increased by one and a half years over the decade, average life expectancy in counties where mountaintop removal occurs has generally decreased. Mountaintop removal areas also have significantly higher mortality rates than other areas in Central Appalachia, according to multiple studies conducted by researchers at West Virginia University. In 2011, a study of more than 400 Appalachian and non-Appalachian counties found that mortality rates were the highest in areas with mountaintop removal between 2000 and 2007. Overall mortality rates are significantly higher in areas with mountaintop removal. 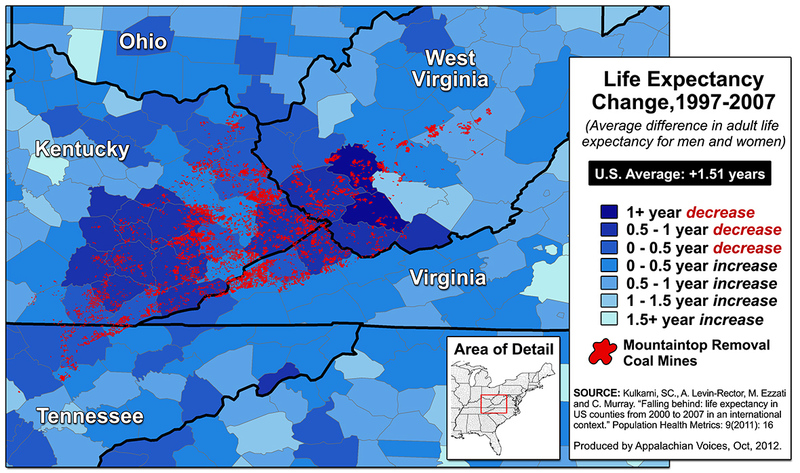 Average life expectancy has decreased across the area where mountaintop removal occurs. Kentucky and West Virginia rank 49 and 50 in preventable hospitalizations. Heavily strip-mined communities in Appalachia are among the unhealthiest in the U.S. In 2013, the Gallup-Healthways Well-Being Index ranked Kentucky and West Virginia — the two states where mountaintop removal is most prevalent — second to last, and dead last in citizens’ overall health and happiness. Ranking by congressional districts shows similar results: out of 434 districts nationwide, those where mountaintop removal is most pervasive — W.Va-03 and Ky-05 –ranked 433 and 434, respectively. As a result of poor health and oppressive living conditions, including a rough economy, Central Appalachia has consistently lost population due to attrition. 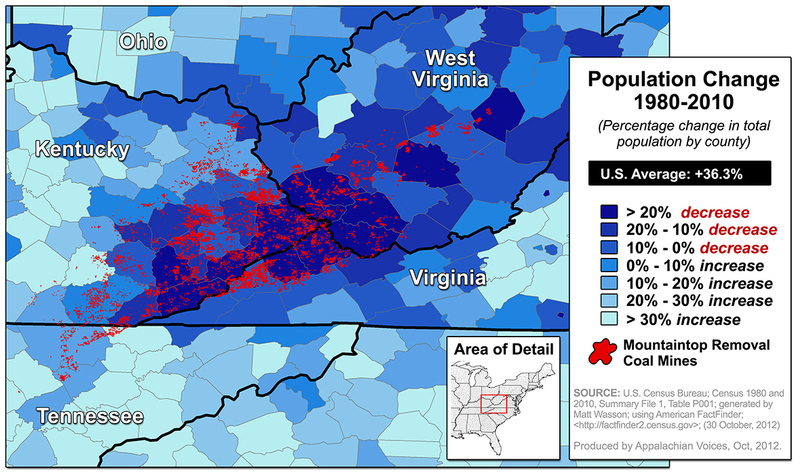 While the average population of U.S. counties increased by 36.3 percent between 1980 and 2010, more than half of the counties in the affected region lost population, including McDowell County in West Virginia, which lost 56 percent of its population, falling from 49,747 to 22,113. 1. Hendryx, M., L. Wolfe, J. Luo, and B. Webb. (2011) “Self-Reported Cancer Rates in Two Rural Areas of West Virginia with and Without Mountaintop Coal Mining.” Journal of Community Health. 2. Hendryx, M., E. Fedorko, and A. Anesetti-Rotherme. (2010) “A Geographical Information System-Based Analysis of Cancer Mortality and Population Exposure to Coal Mining Activities in West Virginia.” Geospatial Health 4(2), 2010. 3. Hendryx, M., K. O’Donnell and K. Horn. (2008) “Lung cancer mortality is elevated in coal-mining areas of Appalachia”. Lung Cancer. 62 : 1-7. 4. Hendryx, M., and L. Esch. (2011) “Chronic Cardiovascular Disease Mortality in Mountaintop Mining Areas of Central Appalachian States.” Journal of Rural Health. 5. Hendryx, M. and K. Zullig. (2009) “Higher Coronary Heart Disease and Heart Attack Morbidity in Appalachian Coal Mining Regions.” Preventive Medicine. 6. Kulkarni, SC., A. Levin-Rector, M. Ezzati and C. Murray. “Falling behind: life expectancy in US counties from 2000 to 2007 in an international context”. Population Health Metrics. 9(2011): 16. Other Sources: U.S Center for Disease Control, West Virginians for Affordable Healthcare, United Health Foundation, Gallup Well-being Index.